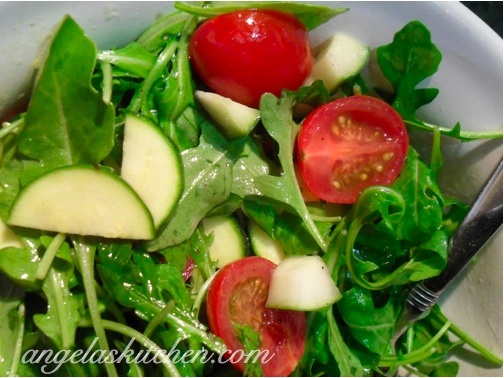 In a bowl, place all of the veggies (arugula, tomatoes, zucchini, cucumber). In a small jar, place all of the dressing ingredients, cap jar. Shake jar well to mix dressing. pour 2/3 of dressing on salad and toss. Top with walnuts and serve the rest of the dressing on the side for those who would like a bit more.